Sunday night....again! The teachers' least favorite day of the week (and time!). 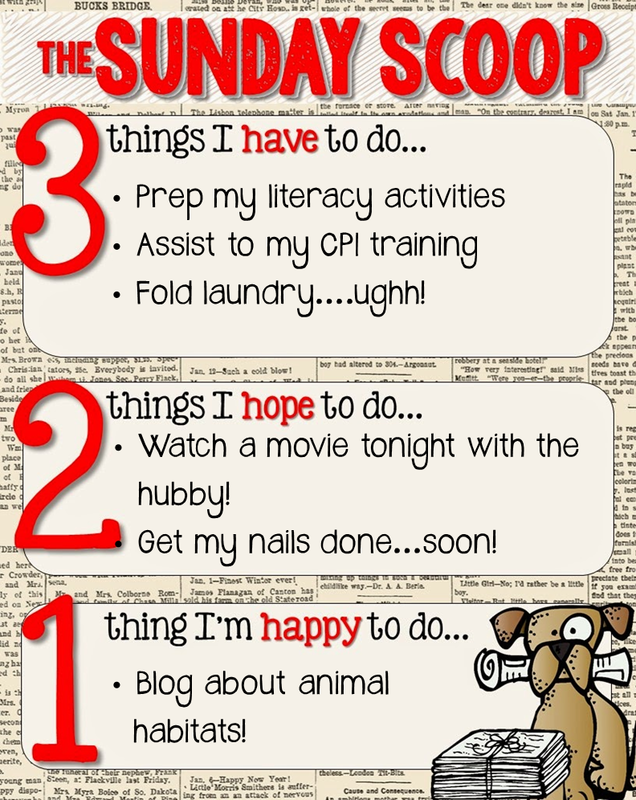 And it's also time for a linky with The Teaching Trio, for the Sunday Scoop! - Prep my literacy activities - each week I provide my students with literacy activities to reinforce specific areas of need. Last week we worked on syllables, this week we will work on beginning sounds. -CPI training - I had a wrong concept of CPI (like many others taking this certification course). I am sure we all will benefit from this course. -Laundry - I have to fold laundry, because I just can't stand clean laundry sitting in the basket...almost done! - Watch movie with the hubby, The Interview. - Get my nails done - I am in urgent need of getting these under control. - Blog about the animal habitats my students made last week. Being able to produce, hands-on, a habitat of their choice, really helped make connections and relate better to the my animal habitats we studied. I'm not CPI trained, but all of our paras are. I've heard it's a great training. UGH... Laundry.... you reminded me that I have to finish mine! Your students' animal habitats sound fantastic. Can't wait to read the post.